Filmmaker Robert Gates and journalist Penny Loeb traveled nearly 5,000 miles to discover how mining and timbering helped cause some of the nations worst floodsdamaging or destroying 12,000 homes and businesses in West Virginias southern coalfields. Damage losses total over $1 billion. These floods bore no comparison to those better known the 1997 Red River in North Dakota and the 1993 Missouri River. Water didn't just spread out from creeks and rivers, it roared down mountains bared by mining and timbering and piled rocks and gravel over and around countless homes never considered anywhere near a flood plain. In this straightforward documentary, coalfield residents explain the role of mining and timbering. A tragedy, yet a story of hope since the film helped bring about stronger mining regulations. However, logging remains virtually unregulated. 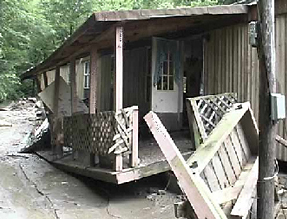 Mucked could show coalfield residents how to better control logging and protect themselves from future floods.